Savannas tend to occur in warm climates with an annual drought, with soils typically low in nutrient capital and poor water-holding capacity. Interactions between trees and grasses is dominated by competition for water and nutrients, rather than light or growing space. At a broad, continental scale, PAM is the most significant of the four ecological determinants, with increasing rainfall correlated with increased tree cover and in general, a decreased grass biomass. PAM can be quantified via a range of parameters, from simple measures such as annual rainfall or via water balance parameters (rainfall as a fraction of potential or actual evapotranspiration) or soil characteristics (water-release characteristics, soil-storage capacity). At fine spatial scales, soil physiochemical properties (PAN) have a more significant influence and the interaction with PAM is often termed the PAM/AN plane. Nutrient availability is largely a function of soil moisture and dry season nutrient uptake, and nitrogen mineralization, in particular, is limited by low levels of PAM. Significant plant growth is only possible during periods of high PAM that releases available nutrient via mineralization. Soils of semiarid savanna can have a higher intrinsic fertility when compared to highly leached soils of mesic sites, but this nutrient capital is only available for uptake during moist periods. Savanna vegetation receiving similar rainfall can exhibit contrasting structure and floristics, simply due to fine-scale changes in soil type. Figure 3 Interactions between the environmental determinants of savanna structure. 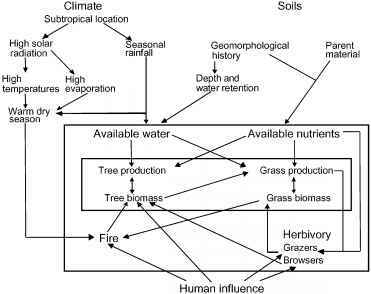 The relative tree and grass biomass and productivity is determined by available water, nutrient, and disturbance regime (fire and herbivory). These determinants are in turn characterized by climate and soil type for any given location. 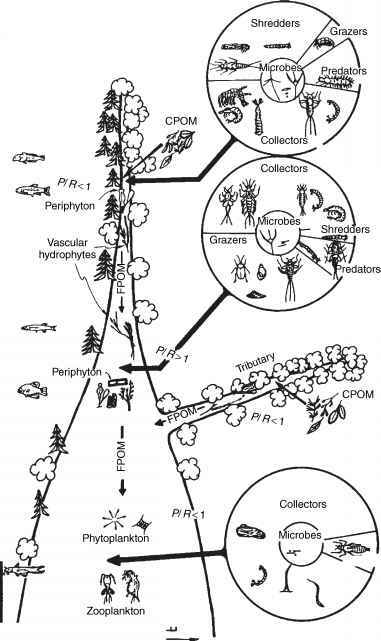 Reproduced from House JI, Archer S, Breshears DD, and Scholes R (2003) Conundrums in mixed woody-herbaceous plant systems. Journal of Biogeography 30: 1763-1777, with permission from Blackwell Publishing. A good example of this interaction comes from the long-term savanna research site of Nylsvley in South Africa; here, nutrient-poor, broad-leafed savanna, dominated by Burkea africana surround patches of nutrient-rich soil that support a very different savanna type, a fine-leafed savanna dominated by Acacia tortilis. Both savanna types experience the same climate, but differences in soil parent material result in higher levels of soil available N and P in the fine-leafed patches. Productivity of the fine-leafed savanna is approximately double that of the broad-leafed system and attracts a larger grazing and browsing fauna. Similarly in South American savanna, soil acidity and aluminum levels significantly affect structure and floris-tics independent of rainfall. Fire is an important landscape-scale determinant that impacts all of the world's savanna. Fire is an inevitable consequence of the annual cycle of profuse herbaceous production during the wet season followed by curing of this material in the dry season, when climatic conditions are ideal for burning. Savanna fires are virtually all surface fires, consuming the highly flammable herbaceous layer. Crown fires rarely occur, as the foliage of savanna trees and shrubs are of low flammability. Human ignitions largely control fire behavior and extent in savanna, with some fires started by dry lightning strikes. Savanna fires spread rapidly through the surface fuels and high soil temperatures do not persist for longer than a few seconds to minutes. While these fires have a significant impact on aboveground plant parts, there is limited impact on savanna seed banks or belowground regenerative plant parts. Fire has a major role in restricting tree establishment and growth, as evident from long-term fire exclusion plots (>25 years) in southern African and north Australian savanna (Figure 4), which have resulted in a woody thickening. Frequent fire events can reduce tree seedling establishment and the ability of saplings to escape the flame zone via height growth. This limitation on tree establishment enables grass persistence and growth, maintaining the fuel load. The aerial stems of small seedlings and suckers are often killed during fire but the individuals are able to resprout from lignotubers or from other underground and stem basal tissues. Seedlings less than 6 months old have been observed to resprout in some species (e.g., Eucalyptus miniata) and frequent fire in the savannas will kill or maintain tree seedlings as a suppressed woody sprout layer until there is a sufficient fire-free period for them to escape the fire damage zone. Species can survive for at least 40 years as suppressed sprouts, during which time they develop significant lignotubers which aid in rapid growth during fire free periods. Figure 4 Impacts of overgrazing and fire on savanna structure. Plate (a) is an overgrazed native grass paddock in semiarid savanna in north Australia (Kidman Springs Station, Victoria Rivers District, NT) at the end of the wet season of 1973. This site would be subjected to wind and water erosion, resulting in further decline in health and productivity of such sites. Exclusion of grazing and fire (Plate (b) has resulted in a complete recovery of structure and function, with return of trees and grasses stabilizing soil surfaces, increased water capture and a recovery in nutrient availability and cycling. Photos courtesy of John Ludwig, CSIRO. cause a shift in species composition, favoring vegetatively reproducing species. However, fire is also important for the sexual regeneration of some species, as burning induces flowering and fruit dehiscence in many cerrado species and facilitates pollination in others. Most perennial grass species are generally less affected by burning and regenerate from basal leaf sheaths protected underground. Some perennial (e.g., Trachypogon plumosus) and annual (e.g., Andropogon brevifolius) grass species decrease in abundance after a long-term absence of fire. Prior to human occupation and use of fire in savannas, lightning would have been the dominant source of ignition and it is likely that extensive but infrequent fires would have occurred. In Australia, humans have intentionally used fire for at least 40 000 years and in Africa for potentially 1 million years or more. Large proportions of savanna regions are burnt each year for a variety of reasons: land clearing, livestock management, property protection, conservation management, and cultural purposes. In African savannas, fires burn between 25-50% of the arid 'Sudan Zone' and 60-80% of the humid 'Guinea Zone' each year. Approximately 65% of Eucalyptus dominated savanna woodland and 50% of savanna open forest in Kakadu National Park, northern Australia was burnt annually between 1980 and 1994. With the progression of the dry season, fire intensity increases due to fuel accumulation from curing litterfall and grass senescence resulting in an increased combustibility of fuels plus more severe fire weather (i.e., higher temperatures, stronger winds, and lower humidities). Early dry season fires (when fuel accumulation is low and curing incomplete) tend to be low-intensity, patchy, and limited in extent. Fires later in the season are of higher intensity and produce more extensive and homogeneous burning. Impacts on vegetation depend on fire intensity, distribution, and timing (fire regime) in relation to the vegetative and phenological cycles. Determining direct effects of fire on savannas is often difficult due to confounding effects of herbivory. Nevertheless, long-term burning experiments have shown that the higher-intensity, late dry-season fires are the most damaging to woody species. Two common images of savannas are herbivory by large, native ungulates, particularly in Africa and the widespread grazing by domestic herds, particularly cattle. A more neglected group of savanna herbivores are the invertebrates, particularly grasshoppers, caterpillars, ants, and termites. Mammal herbivores are typically categorized as grazers, browsers, or mixed feeders, who can vary their diet depending on food availability. Mammal and insect herbivores impact on savanna structure and function via consumption of biomass, seed predation, trampling of understory, and the pushing over and killing of trees and shrubs. The importance of herbivory as a determinant varies between savanna regions, and appears to largely reflect the abundance of large herbivores present. Large herbivore diversity and abundance are much higher in Africa than in Australia, Asia, or South America. More than 40 large wild herbivore species have been described in African savanna. In contrast, only six species of megapod marsupial have been considered as large herbivorous mammals in the Australian savannas, and only three species of ungulates are regarded as native South American savanna inhabitants. Domestic animals, particularly cattle, buffalos, sheep, and goats, are now the dominant, large herbivores in most savannas. Large herbivores can lead to changes in species composition, woody vegetation density, and soil structure. For example, grazing pressure in Africa and Australia has led to a decrease in palatable, perennial, grazing-sensitive tussock grasses, and an increase in less palatable perennial and annual grass and forb species. Changes to the soil surface can occur, including loss of crusts (important in nutrient cycling), development ofscalds, compaction, increased runoff, soil erosion, and nutrient loss. In parts of Africa, woody vegetation density has sometimes been reduced by large herbivores, for example, uprooting of trees by elephants when browsing. Browsers such as giraffes can reduce woody seedling and sapling growth, thereby keeping them within a fire-sensitive heights for decades. By contrast, in many of the world's savannas the density of woody vegetation has increased at the expense of herbaceous vegetation; one of the major causes has been high rates of herbivory. A decrease in grass biomass following grazing leads to a reduction fuel and thus fire frequency and intensity, enhancing the survival of saplings and adult tress. Fire also affects herbivory as herbivores may favor postfire vegetation regrowth. Clearly, fire and herbivory have an interactive effect on savanna structure and function. While less spectacular than large browsers and grazers, insects are often the dominant group of herbivores in savannas, especially on infertile soils supporting low mammal biomass. There is a paucity of data describing their abundance or role in these ecosystems. In a broad-leaved, low fertility savanna of southern Africa, a grasshopper biomass of 0.73 kgha-1 can consume almost 100 kgha-1 of plant material and damage an additional 36kgha~ . This represents a loss of 16% of aboveground grass production. Grasshoppers and caterpillars can account for up to half the grass herbiv-ory, although the rate and proportion varies substantially between years. Fertile, fine-leaved savannas are able to support a larger mammal biomass, and the proportion of herbivory resulting from insect consumption is lower when compared to infertile African sites. The impact of insect herbivores on physiognomy has not been established but they are clearly important herbivores in savannas through their impact on productivity and ecosystem properties.